The theme for Week 17 of the 2015 edition of the “52 Ancestors in 52 Weeks” challenge is “Prosper” and my ancestor is my 3rd great-grandfather, Jan Drogowski. The theme asks for an ancestor that had a “rags to riches” story. I don’t know what Jan’s net worth was, but I think he was prosperous because his occupation in life was quite different from his father’s. Jan Drogowski was born on 14 Jun 1818 in Wilczyn, Wielkopolskie, Poland (Poznań) to Wojciech Drogowski and Marianna Przygoda. Wojciech was a farmer in Wilczyn as was his father, Grzegorz Drogowski. But the reason I chose Jan for the theme of “prosper” is because he did not become a farmer like his father and grandfather. In 1838, the nearly 20-year-old Jan marries 16-year-old Konstancja Kubińska, and in the marriage record Jan is referred to as the “young linen merchant”. I found it interesting that the son of a farmer could become a merchant at a young age. I wondered if he was “marrying up” and gaining the profession of his father-in-law. But Konstancja’s father, Józef Kubiński, was also a farmer. Jan must have worked hard to learn the linen industry at such a young age. And, I can assume he was good at it because over the years he’d have a lot of mouths to feed. Jan’s signature from the 1847 birth record of his daughter, Michalina. The “w” is missing from his signature as surname spelling was a bit flexible (the priest spells his name as Drogowski, however). Another sign that Jan prospered in his merchant profession is his ability to write. 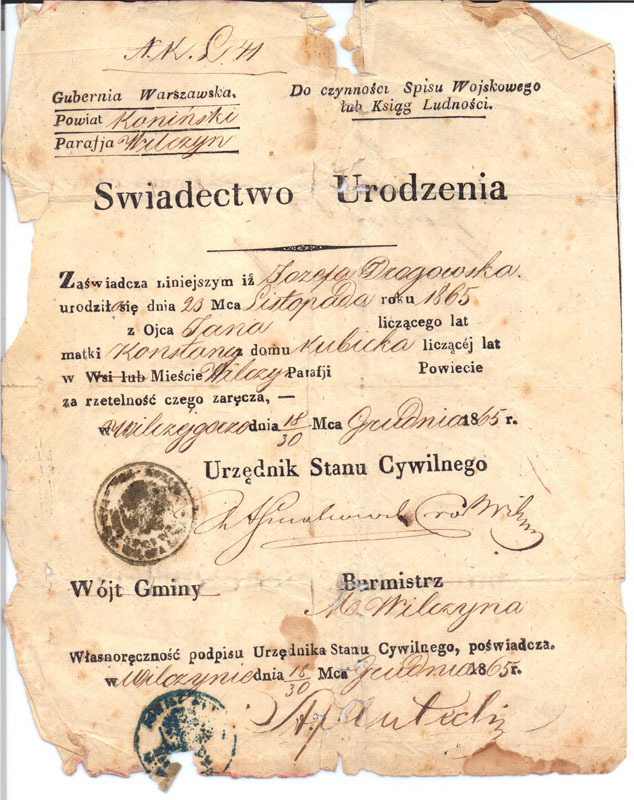 Polish vital records after 1808 include the signatures of the witnesses and essential parties (bride and groom for weddings, parents for the birth of a child). For most records in my ancestral towns, the vast majority of individuals were illiterate – this fact was recorded when no one could sign the church book. In 1838, Jan was illiterate and did not sign his wedding document. However, by 1845 his is able to sign his name to the birth record of his son, Franciszek. I find this significant and indicates a profession that would require literacy to run the business. Of all my Polish ancestors, I have only found two men that were able to sign the records and Jan’s recorded literacy is the oldest I’ve found. Jan and Konstancja had ten children together over a 26-year period: six girls and four boys. Their eighth child, Stanisława, was born in 1860 and is my 2nd great-grandmother. One son, Ignacy, died as an infant. I have not yet indexed all of the Wilczyn records to find death dates for all of the children, but I do know that at least three daughters and the other three sons all lived to adulthood, got married, and started having children of their own in the same parish in Wilczyn. Jan died on 29 Oct 1894 in Wilczyn, Wielkopolskie, Poland at the age of 76. His wife Konstancja would live another two years until she passed away on 18 Dec 1896. 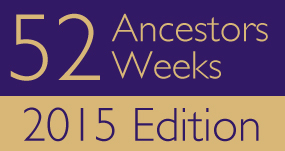 See all of my 52 Ancestors in 52 Weeks stories on the 52 Ancestors page! Sometimes my genealogical research takes an organized and methodical approach akin to the scientific method – or at least obsessive compulsive disorder. 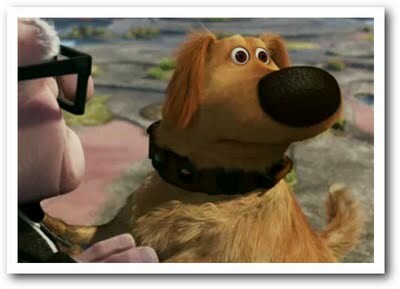 And then other times my research resembles the dog in the animated movie Up who gets distracted every time a squirrel runs past him. While the former research approach may be more useful when it comes to documenting sources or following the genealogical proof standard, the latter can be much more serendipitous and fun. You never really know what you’ll find when you don’t start off searching for anything in particular or you go down roads you didn’t intend to follow! During the pre-Partition period Wilczyn belonged to Trzemeszno county (small town about 30 km from Wilczyn), and to Powidz county (small town near Strzelno) during the Napoleon Campaign 1793 – 1812. From 1812 to 1815 it belonged to Pyzdry county and after the Vienna Treaty got included in Konin county. From 1867 to 1934 Wilczyn belonged to Slupca county and from 1934 again to Konin, where it lies to present day. I know enough genealogical Polish to read the record for the birth of Józefa Drogowska, born 23 November 1865 to Jan Drogowski and Konstancja Kubicka. Wait a minute! Those names sound familiar…the parents are my 3rd great-grandparents! Józefa is the sister of my 2nd great-grandmother, Stanisława Drogowska (born 04 Jun 1860 in Wilczyn – died 30 Dec 1918 in Dobrosołowo). There are only four documents on the site, and this is one. There is no explanation as to why this particular document is shown on the site. It is also shown with the images under Wirtualne muzeum or virtual museum. I would love to know why it is posted on the site and if a descendent of Józefa was responsible for posting it. Now I have real research to do! Back on August 9, 2009, Randy Seaver presented another Saturday Night Genealogical Fun (SNGF) challenge for readers to document their sixteen great-great-grandparents. I responded to the call with Sweet Sixteen: My Great-Great Grandparents. But, my tree was a little bare in some spots. I did not know at least 4 names and was “iffy” on two more. In fact, I only had documented birth and death dates for 3 of the 16. A few months later, I was able to update my list with A Sweeter “Sweet Sixteen” – I had documented proof of 4 of the missing names. Then, last year I attended the NGS conference in Salt Lake City and found a lot of additional information that was previously missing with many marriage and birth records. Today, Randy posed a very similar SNGF challenge. I decided to take a look at my list to see what I had learned in the two years since my original post. While I still have a lot of research to do, I was able to add 4 of the “unknown” birth details into the “documented” category (which means I know the names of 8 more great-great-greats!). A bigger challenge was correcting the place names. Rather than simply put the name of the town and the current country, I attempted to figure out the town, county or equivalent, state or equivalent, and country name at the time of the event. For my Polish ancestors, whose borders changed more frequently than I can keep track of, Steve Danko’s post on Describing Place Names in Poland was invaluable. I hope I got them right! My ancestry remains the same as calculated two years ago: 62.5% Polish (the guy born in what is now Belarus is ethnically Polish), 25% German (technically Bavarian since Germany did not exist as a unified state until 1871), and 12.5% presumed Czech (Bohemian). Thanks, Randy, now those blanks are really bothering me! Country of Origin – The surname DROGOWSKI is Polish. According to the World Names Profiler, Poland has the highest frequency per million residents with this name at 4.12 per million. The United States comes in a distant second at .56. Spelling Variations – Other names derived from the same root include DROGOŃ, DROGOŚ, AND DROGOSZ. (Source: Polish Surnames: Origins and Meanings, Second Edition by William F. Hoffman) The feminine version of the surname is DROGOWSKA. Surname Map – The following map illustrates the frequency of the DROGOWSKI surname in Poland. The name is not very popular – there are only 158 individuals listed with the surname, and they can be found in 36 different counties and cities. The large yellow area in the left center area of the map is where my Drogowski family comes from (Konin area). Distribution of the DROGOWSKI surname in Poland. SOURCE: Mojkrewni.pl “Mapa nazwisk” database, http://www.moikrewni.pl/mapa/kompletny/drogowski.html, accessed October 16, 2010. Famous Individuals with the Surname – none that I have found. My Family – My Drogowski family comes from the town of Wilczyn near Dobrosołowo in Poland. My earliest ancestor so far with this surname is Wojciech Drogowski, who was born in Wilczyn in 1773. The line of descent is as follows: Wojciech (b. 1773, Wilczyn – d. unknown, married Maryanna née Przygodzka) > Jan (b. 14 June 1818, Wilczyn – d. 29 October 1896, Wilczyn, married Konstancja Kubicka) > Stanisława (b. 23 May 1860, Wilczyn – d. 30 December 1918, Dobrosołowo). Stanisława married Wincenty ŚLESIŃSKI on 03 September 1879 in Wilczyn. Their oldest daughter, Wacława Ślesiński (b. 14 Aug 1885, Dobrosołowo, Poland – d. 20 May 1956, Philadelphia, PA, USA), is my great-grandmother. She immigrated to the United States in 1903 following her husband, Jozef ZAWODNY. My Research Challenges – I found the 1818 birth record of Jan DROGOWSKI earlier this year when I visited the FHL in Salt Lake City. I am very fortunate that the Catholic church records for the town of Wilczyn are microfilmed beginning in 1750. From Jan’s birth record, I learned that his father Wojciech was 45 years old and from Wilczyn. Therefore, I should be able to locate Wojciech’s birth around 1773 in the Wilczyn records and go back one more generation! The Wilczyn films are at the top of my genea-to-do list. Other Drogowski Researchers – Paul Kankula has a web site with research on his DROGOWSKI great-grandparents. Some of the Drogowski families on his “Unknown Individuals” page were born in Wilczyn and immigrated to Pittsburgh, PA. I will have to investigate to see if this Drogowski family are cousins to my Drogowski family. Surname Message Boards – Ancestry has a Drogowski message board. There are some Drogowski graves listed at Find A Grave here. Links to all posts about my Drogowski family can be found here. This post is #9 of an ongoing series about surnames. To see all posts in the series, click here.